Now simply known as the Globe-Democrat Building, the Midwest Terminal Building was originally intended to house a freight terminal for the Illinois Terminal System underneath a 19-story building. The Illinois Terminal company developed the building. As designed by Mauraun, Russell & Crowell, the Midwest Terminal Building would have had two levels of parking, underground freight loading from the Illinois Terminal’s subterranean lines, a lobby and retail base, 16 floors of warehouse or general commercial space and three floors of offices above. The building would be accompanied by a 32-story tower one block south at the corner of Twelfth Street (now Tucker Boulevard) and Washington. This tower would house the passenger terminal of the Illinois Terminal Railroad, which provided electric interurban rail service to cities across Illinois including Peoria, Decatur and Urbana. Both buildings would be powerfully cubic, streamline Art Deco masses making dramatic use of setbacks. The Midwest Terminal Building was designed with a limestone-clad base and an elaborate carved entrance motif. Utility giant Illinois Power & Light Corporation had acquired the The Illinois Terminal Company in 1928, and had sought to expand the railroad’s network of electric interurban and freight rail lines. Between 1930 and 1932, the company built a massive cut underneath Twelfth Street from Cass Avenue south to Washington Avenue. Twelfth Street was elevated by steel viaduct over the cut; this structure was demolished and the cut filled starting in 2010. The line underneath Twelfth Street connected north of Cass Avenue to a railroad viaduct now known as the Iron Horse Trestle, which in turn connected to the McKinley Bridge across the river. Passenger service started declining after the Peoria line closed in 1940, and ceased completely in 1956. Freight use of the line underneath Twelfth Street continued until around 2004. The real estate project also met a premature end. The Midwest Terminal Building opened in 1932 much smaller than proposed. 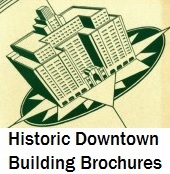 The four-story steel tower shown in the brochure here was never constructed and the building stands several stories shorter than the original plans detail. After excavating the site for the tower at Washington and Twelfth, and constructing the foundation, the Illinois Terminal Company abandoned the project. The passenger terminal was moved to the Midwest Terminal Building, which later became known as the Central Terminal Building. In 1959, the St. Louis Globe-Democrat newspaper moved from its headquarters two blocks north and renamed the building the Globe-Democrat Building. Today the Midwest Terminal building remains occupied as a general use commercial building and is named the Globe Building. The passenger lines are long gone, and the track area is now additional parking space. The building’s agents were Hodge, Nicholson & Porter, Inc., located in Chicago and St Louis. The firm printed this brochure in 1931. The brochure forecasts an opening date of January 1932. The standard inclusion of first floor and sample upper floor plans is attenuated by a cross section of the building showing lower level automobile parking as well as a mock aerial view of downtown. The aerial view shows “St. Louis’ New Skyline” on Twelfth Street, interestingly composed largely of buildings to be designed by Mauran, Russell & Crowell: the Midwest Terminal Building and the Illinois Terminal Railroad Passenger Terminal tower, the St. Louis Star Building and the St. Louis Globe-Democrat Building (now the St. Louis Post-Dispatch Building). Another boosterist gesture is the prominent display of the phrase “St. Louis…The Gateway to the Southwest” on the booklet’s pages. This phrase indicated the city’s strong regional trade network in Arkansas, Oklahoma and Texas, in which this building might play a role. This page was written by Michael R. Allen with Laurel Morris. This entry was posted in Downtown. Bookmark the permalink.